The Best of the Delta. 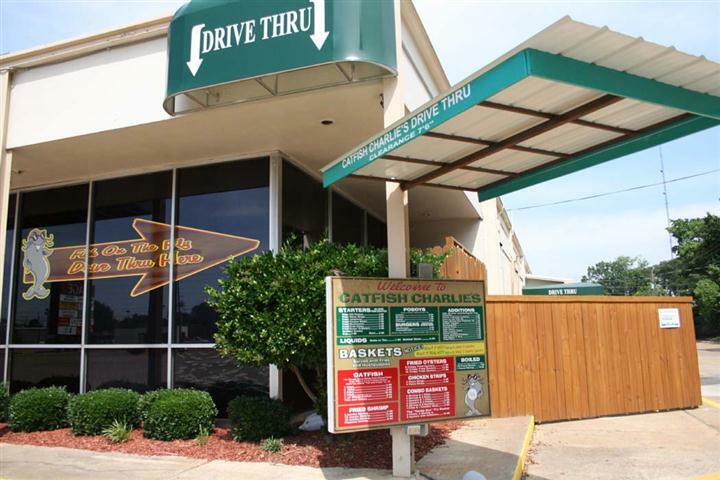 Catfish Charlie’s has earned that title year after year by offering nothing less than the finest seafood in town. Found in the Office Depot Shopping Center on Louisville Avenue, Catfish Charlie’s is truly a different experience. From the unique “Whole filets” and the famous “Thin & Crispy Catfish” to the jumbo shrimp (either boiled or fried), Catfish Charlie’s knows how to put a smile on your face. Though many days the line is hanging out of the door when you arrive, you are sure to be waited on quickly and usually receive your cooked-to-order food in less than ten minutes. The best seller has been the U.S. Farm-Raised Thin & Crispy", everyone seems to have their own favorite. The thin purple onion rings and the fried dill pickle slices are very unique and by far are the two most popular appetizers; the homemade mozzarella sticks and the fried green "maters" have been whopping success as well. The shrimp and filets combo baskets and the oysters are always high up on the sales charts. And while it may sound strange, the cheeseburgers are to die for! The discovery of a wonderful burger is not the only surprise found at Catfish Charlie’s. Perhaps the biggest surprise is that you can eat very healthy at Catfish Charlies! Grilled or blackened Catfish, Tilapia, Salmon or Chicken is always a great choice. All of the grilled or blackened meats are seasoned with a local flare with homemade spices. They can be served over a fresh salad or as a plate with grilled veggies and homemade Jambalaya. Other “from scratch” sides include, Red Beans and Rice, Cajun Mashed Potatoes, Crawfish Etouffe, Seafood Gumbo, Cajun Boiled New Potatoes and the good old Idaho Potato. Catfish Charlie’s offers catering services for any occasion - and offers special corporate pricing as well. Proprietor, Doug Wood, has deep history in the food service business. From the time he was old enough to walk, he wanted to help out at both of his family's restaurants. Doug's grandfather, Harry Wood, owned the famous "Harry's Seafood" across from North Monroe Hospital. His Uncle owned “Bend of the River” in Alto, Louisiana. Doug says that the restaurant business gets in your blood and it is hard to walk away from. He will tell you his one desire is to make Catfish Charlie’s the legend that Harry’s and Bend of the River both were. He knows there will be hundreds of more days of hard work to get to that point, but the task, in his mind, is worth the work!